- Max. 100 memory block for test condition (step) setting. And each step can be named individually. To operate the GPT-9800 series over the specific temperature range may cause damage to the circuit. 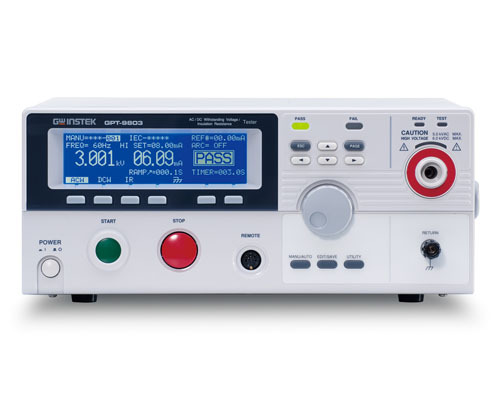 And, do not use the GPT-9800 series in a place where strong magnetic or electric field exists. Note The specifications apply when the GPT-9800 series are powered on for at least 30 minutes at 15°C~35°C. [ 1 ] Applicable to all models. [ 2 ] The maximum adjustable voltage to AC 5.100kV. [ 3 ] Output Limitation in AC Withstanding Voltage Testing as below.